William is applying another light coating of seed at 30 lbs to the acre. 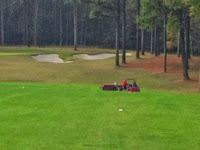 This is not much but it allow us a chance to go over every fairway again along with doubling up on any thin areas we may see while we are out there. This process is usually done after we have had a frost or two. 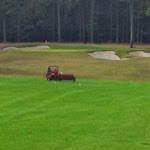 The goal for the turf care staff now is to fertilize the ryegrass every few weeks to get the rye grass thick before "old man" winter sets in.